Celebrities are THE fashion icons for beauty, makeup — and of course, hairstyles. Cate Blanchett is no exception. That’s why we’ve got Cate Blanchett photo galleries, pictures, and general beauty news on this celeb. Her style is totally inspiring and worth checking out. So if you’re searching for some beauty tips, hairstyle options, and fashion advice, turn to Cate Blanchett. She’ll bring your fashion to a whole new place. Cate Blachett's sleek updo is so perfect. See how to get the look:1. Apply smoothing cream to damp hair and blow dry straight with a paddle brush. Use a round brush near your roots while blow drying to add volume. 2. Brush your hair back into a ponytail and secure it with an elastic. Twist your pony around the elastic to make a pretty ballerina bun, and pin it in place with hairclips.3. Mist your bun with strong-hold hairspray to keep it in place. 4. Put a drop of shine serum on your palms and smooth it over the top of your hair to finish. 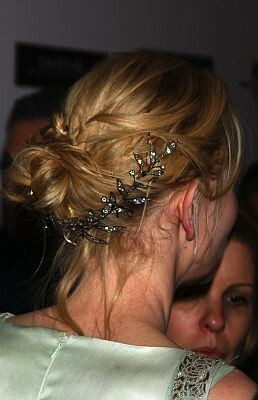 Cate Blanchette's twisted bun, and glitzy hair accessory, puts a fun, flirty spin on the simple updo. What to do: 1. To start, put a dollop of mousse on your palms and rub through your hair. 2. Twist some random sections of hair and pin down with bobby pins.3. Pull all of your hair into a low bun, letting strands fall out near the nape of your neck (which totally says you're stylish without looking like you're trying too hard).4. Add a snazzy headband or clip on an accessory below the bun.